Salad | drive-thrus are for lazy people. This. salad. is. SO. good. Trust me, you won’t be disappointed – the secret is to “marinate” the kale overnight in the dressing. It soaks up the flavour so wonderfully, and the taste just ends up being more intense the longer you let it sit. Coat the salad mix with the dressing. Let it marinate! This is KEY! 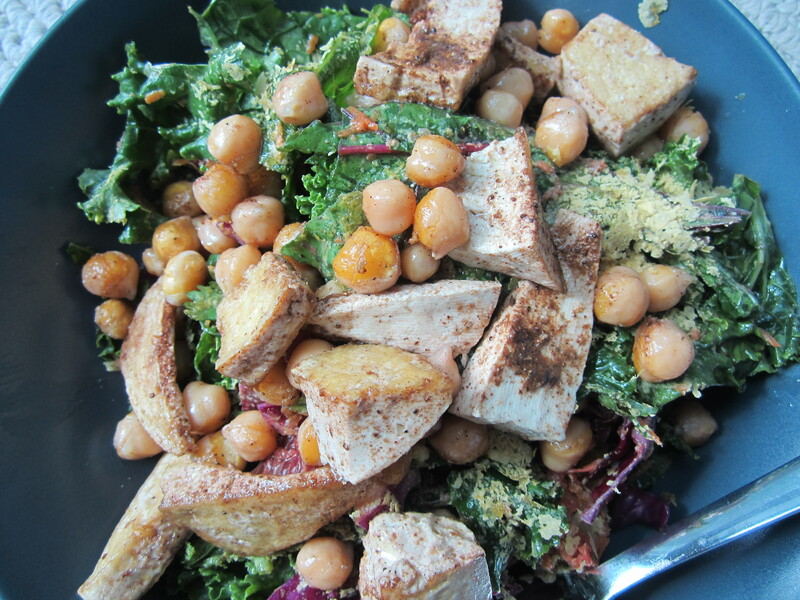 Top with Tofu Strips sauteed in coconut oil, and chickpeas grilled with Garam Masala Indian Spice. I know, this recipe is all over the place – but that’s how I cook! Categories: holistic recipes. 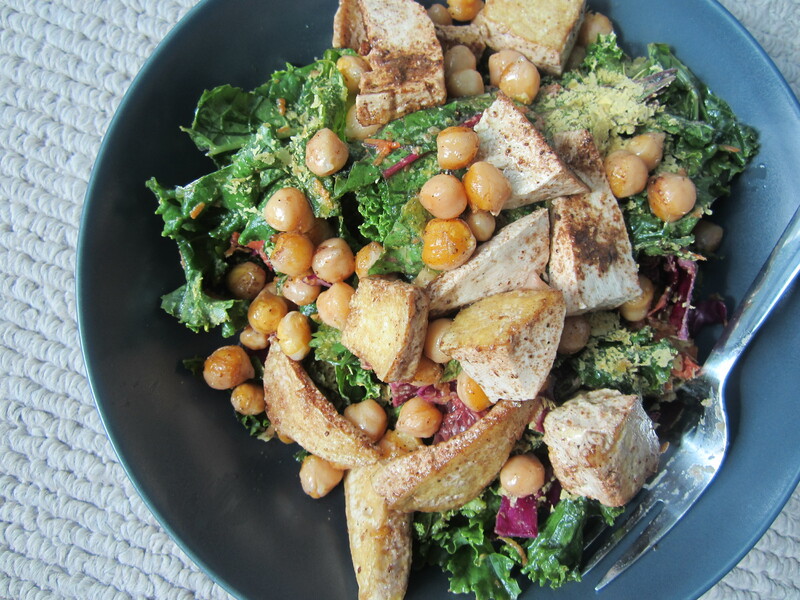 | Tags: dinner, holistic, kale, lunch, nutrition, recipe, Salad, salad dressing, vegetables, yum | Permalink. “If kids grow kale, kids eat kale”. I hope everyone had a very green weekend, with a few drinks for St. Patty’s day of course. Canada is still behind on the trend of banning food dyes. Food dyes are synthetic and completely unnecessary in many of the products they are found in. The only reason that they are often added is for visual appeal, since processed foods have often lost their natural colour. Having a food dye a couple of times per year isn’t going to kill you – but make a conscious effort to avoid them. All of them. Tartrazine, Quinoline Yellow, Sunset Yellow, Carmoisine, Ponceau 4R and Allura Red. One place to check for this Tartrazine; in your Kraft Italian Salad Dressing. Who knew? All the better reason to simply make your own using EVOO, Balsamic, and some dried spices of your choice. Read more about the harmful effects of tartrazine/ yellow # 5 right here. This broccoli-slaw is to die for. Shredded red cabbage, shredded broccoli, shredded carrots. Add in raisins/dried cranberries, and chopped almonds. *Note. It tastes better after ‘marinating’ for a day or two in the fridge. The veggies also start to soften up a little bit. 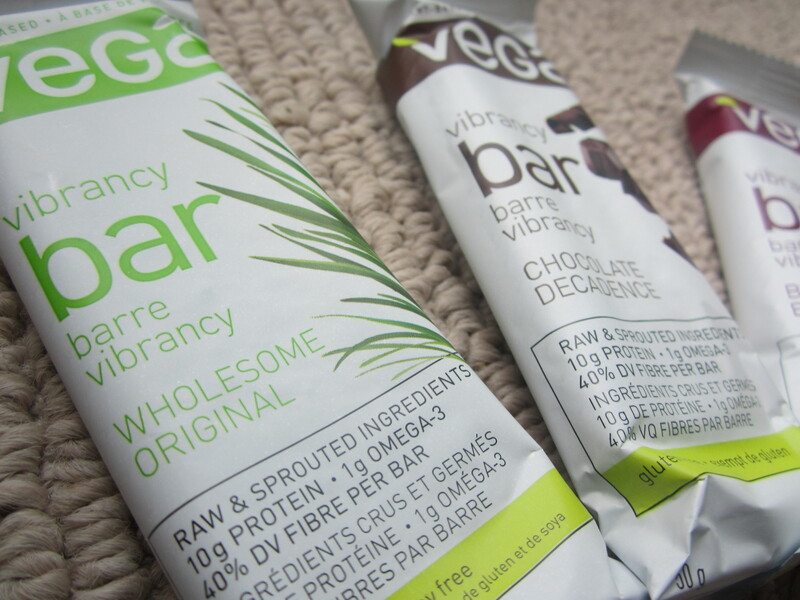 While I was on the go this weekend, I was keeping fueled with these Vega Bars. They came especially handy when I was running late for my Spin class, and didn’t have time to fuel up on a meal at home. Did You See This on TedTalks? This guy (Ron Finley) got fed up with the food options offered in his neighborhood of South Los Angeles, so he decided to plant a garden. He’s ready to help people re-establish their connections to food by putting in the word needed to grow it yourself. “South Los Angeles is home of the drive-thru, and the drive-by… And guess which one is killing more? The drive-thru”. Love this ! So good to hear someone else knock down the drive-thru ! Feel free to leave me a comment below, I’d love to hear from you. Categories: articles + videos, fabulous quotes., holistic recipes. 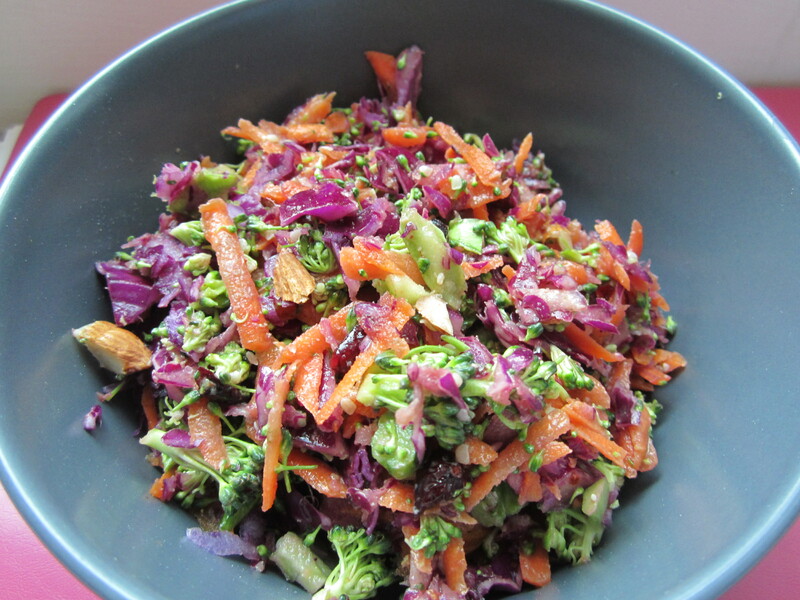 | Tags: almonds, Beer, Broccoli, Cabbage, Carrot, Coleslaw, dinner, Garden, green, Grow, lunch, recipe, Salad, St.Pattys, TedTalks, Video | Permalink.